Urban Decay has added a handful of new colors to their pencil lines this Spring. There's new shades of concealer, eyeliner and lip pencils, take a look! Technically, the 24/7 Concealer Pencils aren't new, but they did get a little packaging update and the amount of shades were doubled to match more skin tones. There's the original four (CIA, NSA, FBI and DEA) plus four new deeper shades to round out the line, KGB, ATF, MI6 and DOD. The new packaging is a deep gem-tone purple and each one features a color-matched band to indicate the shade of each pencil. This is what they used to look like, so definitely a bit of an upgrade in the looks department. The shades are (left to right): MI6, DOD, KGB, NSA, DEA, FBI, ATF and CIA. MI6, DOD, KGB, NSA, DEA, FBI, ATF and CIA. I accidentally broke my DEA one when I tried to swatch it. Oops :( This one in particular seemed a little more fragile than the other shades. Good coverage without being heavy or sticky. 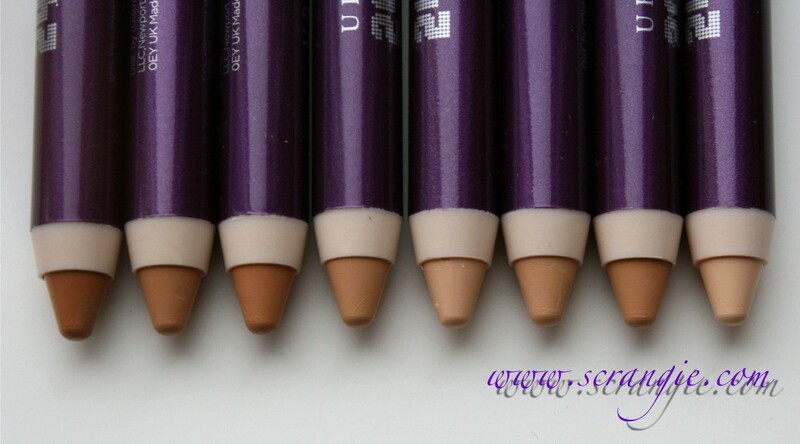 Because of the precise pencil application, it's really easy to use them for contouring. Pencil applicator is more sanitary than my usual brush-tipped pen concealers. No need for a separate brush, and no need to warm the formula first. Apply directly to the desired area and blend with a fingertip. Simple and not messy! Better shade range than before. The pencils must be sharpened, and they're larger than eyeliners so you need the Urban Decay Grindhouse sharpener (or other larger-barreled sharpener). A twist-up pencil would be easier and waste less product. 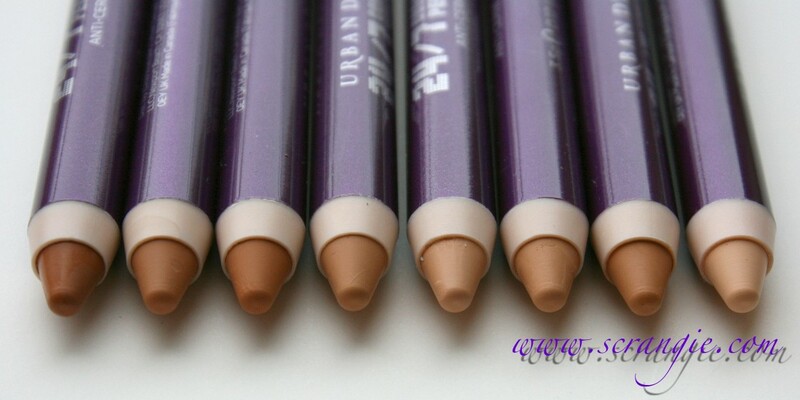 While they have added some deeper shades, and there's a great selection for fair to medium-tan shades, the darker end of the range is still lacking. If applied over areas with dry or flaky skin, the concealer tends to look dry and accentuates the flakes. I am not a regular concealer user, but when I do use one, I usually go for creamy concealers like Benefit's Erase Paste (in a jar) or Milani's HD Advanced Concealer (in a brush-tipped pen). I actually bought one of these 24/7 Concealers right when they came out, but I bought the wrong shade and never ended up using it more than once or twice, so I never really got a chance to test the formula until now. 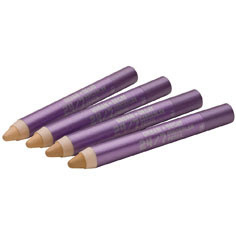 The formula of the 24/7 Concealer Pencils is nice and creamy and easy to blend, but the pencil form makes it super easy to apply. The coverage is good over freckles, scars and hyperpigmentation and once you set it with a powder, it really does last all day. It doesn't feel sticky or heavy or cakey. It's light but dense. I like it; next time I need to use concealer, this is the one I'll choose because of the ease of application (apply directly to the face, no need to blend on the back of your hand first), light texture, blendability and level of coverage. My shade is DEA, but FBI works well on my skin tone too. I'm really excited about this one. I'd been hoping for full size versions of Perversion and Woodstock, which were previously limited edition and only available as parts of different sets, and now look! They exist in individual, full-size form! And they're permanent, too! Urban Decay 24/7 Glide-On Eye Pencils in Woodstock, Demolition, Perversion. I previously reviewed Woodstock and Perversion here, and Demolition here, in case you'd like to see more in-depth info and a few more swatches. 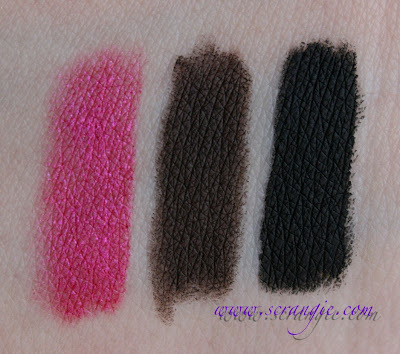 Woodstock is a hot pink with pink shimmer, Demolition is a neutral blackened-brown and Perversion is the blackest, richest matte black eyeliner pencil I've ever used. The texture of all three is smooth, creamy and silky. They glide on effortlessly, can be smudged if you desire, and then once they set (about a minute or two), they last all day. They're just all-around really nice pencils. The only flaw with these is that Woodstock isn't as pigmented as it could be and needs a few swipes to build up opacity. But, yay! How cool is it to ask a company to make something permanent, and then they do it? I know I'm not the only one who has been wanting these and practically begging for them to be made permanent. Super awesome. 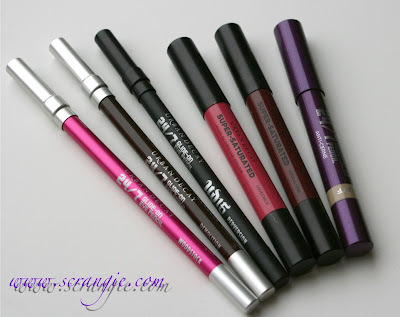 Also new for Spring 2012 are two new shades of the Urban Decay Super-Saturated High Gloss lip pencils. 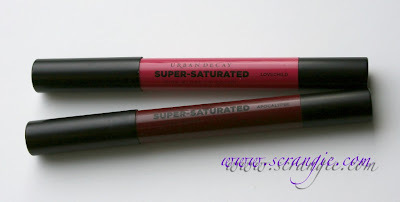 I have not tried the Super Saturated lip pencils before, but I've been really curious about them! They're different than I expected, but really nice. The new shades are Apocalypse (left) and Lovechild (right). 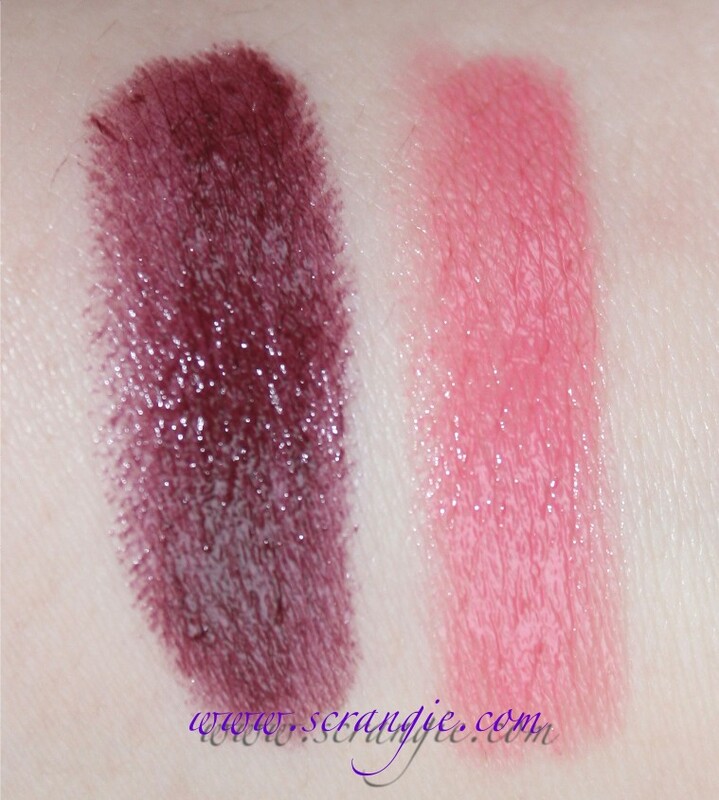 Apocalypse is a deep plum and Lovechild is a pale pink. Apocalypse, Lovechild. See how glossy they are? These are currently a Sephora exclusive. 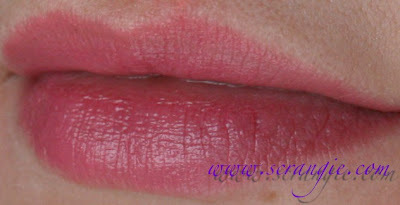 Urban Decay Super-Saturated Lip Color in Apocalypse. In the tube and on my arm, it looks a little more purple-based. In a thin layer on my lips (like here), it looks more wine colored, but has a strong brown tone to it when it's applied a little more heavily. Urban Decay Super-Saturated Lip Color in Lovechild. This is a perfect neutral light pink on me. Not pale and milky and hard to wear, but not dark and staining. More of a "my lips but better" shade on me. They were a lot more silky and glossy than I expected! I thought they'd be more dense and lipstick-like. They're not so smooth that they're balm-like, but they're not dry and stiff like lipstick, either. Easy application, no lipliner or brush required unless you prefer using one. I really like the Lovechild color on me. 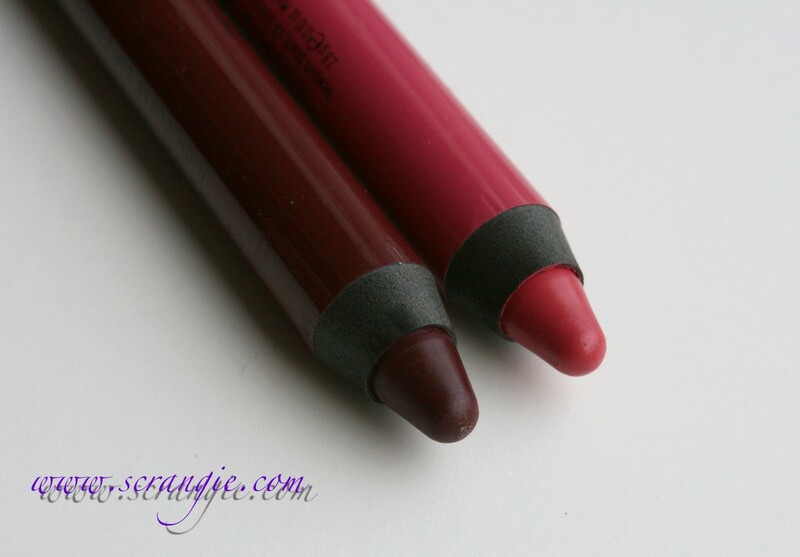 The tubes are color-matched to the lipstick shade. I like that style of packaging. They need to be sharpened with a large-barrel pencil sharpener. Twist-up pencils would be easier and less wasteful. They're not scented, but still have a sort of strange waxy smell to them. They're not moisturizing, but I didn't find them to be particularly drying, either. Apocalypse wanted to settle into my lip lines instead of being completely even like Lovechild. I'm really interested in comparing these to the rest of the shades now. I'm quite fond of Lovechild, and if all of them are as nice and light-feeling as that one, I think I could really fall in love with them. I'm not big on lipstick most of the time because they tend to feel heavy and drying, but these feel nice and glossy. All of these are available now on UrbanDecay.com or Sephora.com. 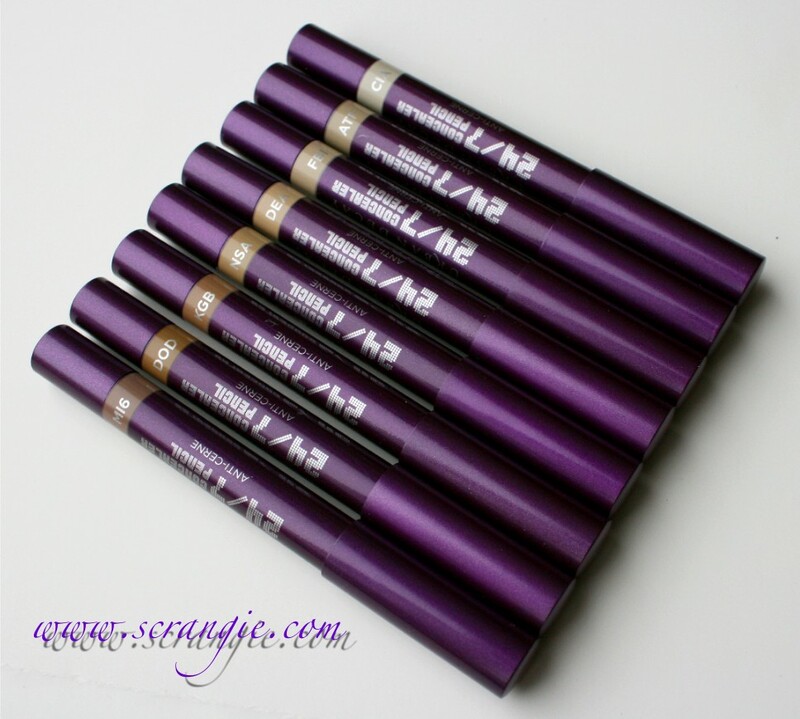 The 24/7 Concealer Pencils and the 24/7 Eyeliners are $18 each, the Super-Saturated lip colors are $19 each. Haha, thank you! I'm so bad at lip swatches. Those two pictures probably took about a hundred tries to get right! XD But I'm making it a point to try to learn to do them since I know people really find them useful. And you really like the wine shade on me? Thank you! I'm still not sure if I like it on me yet... it seems so brown to me! Yes, the wine color looks FANTASTIC on you!! I'm fond of 24/7 Glide-On Eye Pencils and I've been dreaming of Woodstock since the first time I saw it. What very nice news you're giving to me! Woodstock, Demolition, Perversion...finally permanent? Am I dreaming? I'm sure I'm still sleeping. I must wake up and go to find them! Anyway, I like the wine shade on you too! I really love dark shades, but they're quite difficult to fit. And it fits your lips perfectly! I'm thrilled to see that Perversion & Woodstock are permanent. 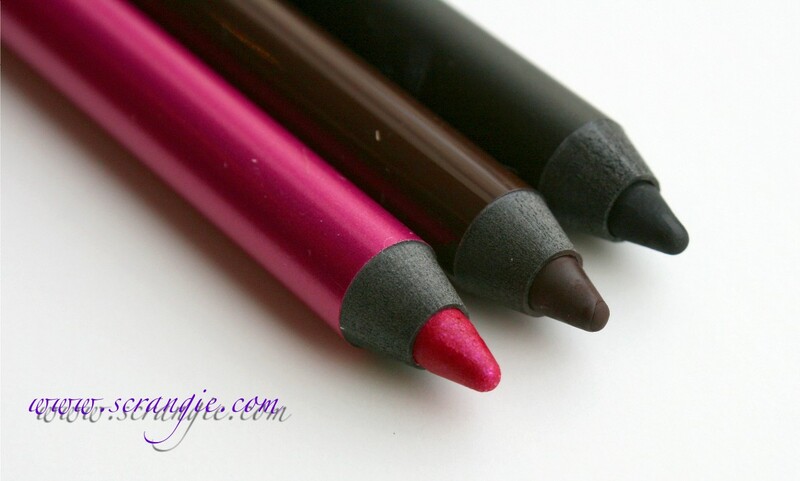 Love Urban Decay eye liner pencils. 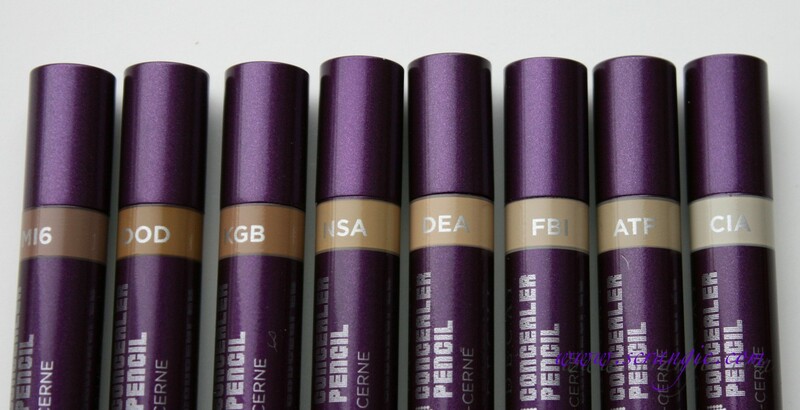 The concealer pencils look really nice. If I ever run out of my concealers I'll try these. I like lipstick & glosses in pencil form. I do prefer that they are the twist up type. Doubt I'll be trying these. 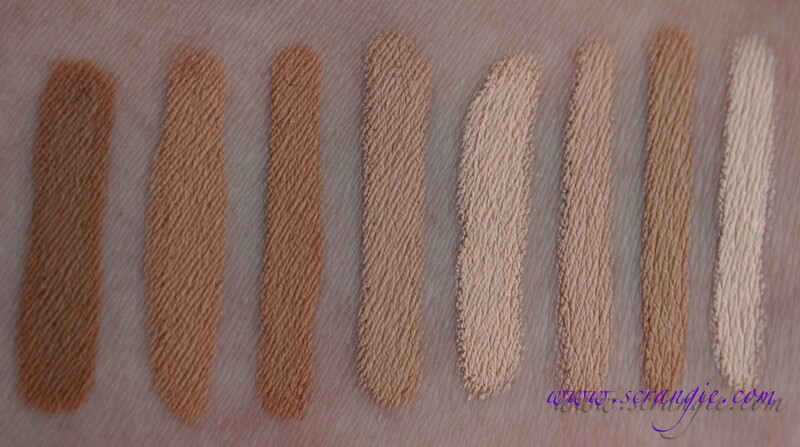 Hi, thanks so much for the concealer swatches! And (wo)man, isn't Pervesion black or what?! 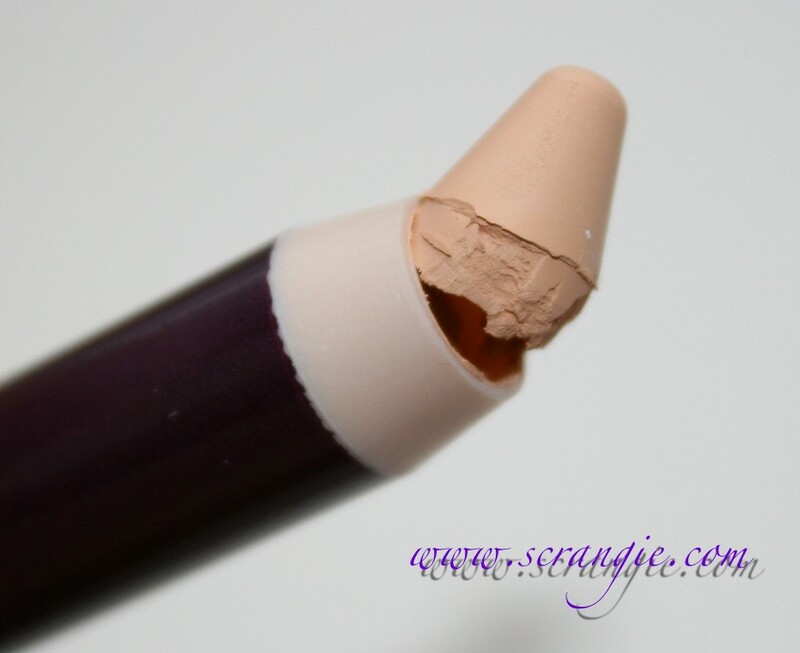 I've been wondering about my concealer shade, from swatches it seems between DEA and FBI - I am Boi-ing shade 1 and Erase Paste 2, do you think DEA is good for me? You sound like you have similar coloration to me- DEA is on the lighter side, FBI is more close to my foundation color- I think either would work for you. If you're Erase Paste shade two, maybe FBI would be a little better since DEA may pull a little light. Thanks for the swatches! I also hate that the UD lip pencil needs to be sharpened, BUT according to Sephora, it contains .32 oz. of product while most lipsticks contain .07 to .12 oz. Not a bad deal, I think I'll finally pick up Crush! Sí que son chulos y pigmentan un montón. I have one of the lip color pencils from the original release (Big Bang) and I really do like it. I don't find it's super long-lasing, but the color is amazing and not at all splotchy/settle-y like it looks like Apocalypse might lean. If you're even on my blog and search Big Bang, it's the only thing that comes up. I also played with some of the other colors and they seem pretty awesome. Thanks! I just went over there and saw it. Looks awesome on you! I have been dying for UD to make Corrupt a part of there regular line! I can't believe they did Demolition instead! Boo Hiss UD! But thanks for the great swatches!! 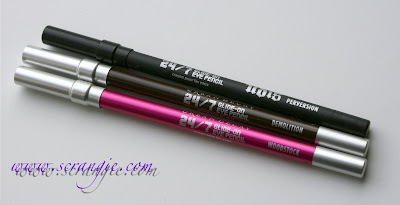 The 24/7 eyeliner pencils are my makeup staple...it's probably one of the few pieces of makeup I wear every day! Naturally, I was pretty excited to see new colors. The pink is so adorable! And I think I have Demolition (I think...it might have been part of their Naked 5-pc mini), and I really like it a lot. I'm always so nervous about wearing bright colors, much less darker colors...so I'll have to just go for it and wear these! So excited about perversion...Zero is always my go to so this would be even more amazing! Excited about Woodstock too! I have it in the 24/7 liquid but I like their pencils better. I really need to try Perversion! I didn't get any of the sets that it wold have came in before, so I'm excited to finally be able to buy it! Ugh the more I see Lovechild, the more I want it. I think I'll have to get it! I love the Woodstock pencil. Gorgeous! Finally Perversion arrives to join the regular shades! I can only see "Perversion" here..ha ha ha so awesome black!!! Anyway.. Thanks for being such an awesome blogger! Thank you for this review! I'm wrapped to have discovered the UD concealer pencils! Where have they been all my life? Many thanks from Australia!